Introduction: Trauma is one of the leading causes of death and disability in the world. Maxillofacial injuries cause fractures and disfigurement of different parts of the face and oral cavity. Aim: The aim is to find the prevalence and pattern of maxillofacial trauma in the Department of Dental Surgery, Government Stanley Medical College, Chennai from June 2013, to March 2014. Materials and Methods: The retrospective study of 153 maxillofacial trauma patient's data from the Department of Dental Surgery of Government Stanley Medical College, Chennai from March 2012 to February 2014. Type, cause, and age-wise distribution of the injuries and the influence of alcohol on the injuries were assessed. Results: Majority of the victims were males and from 20 to 30 years age group. Road traffic accidents were found to be the major cause (74%) and out of that 67% occurred under the influence of alcohol consumption and 85% cases were grievous. Injuries to teeth were found more common in the younger age group, and injuries to soft tissue were found more common in elderly persons. Influence of alcohol has been found to have a strong association with the severity of injuries (P < 0.05). Conclusion: This study points out that road traffic accidents are more common with alcohol consumption being the major contributing factor. This has to be taken seriously into consideration by the policymakers so that preventive programs aimed at behavioral modifications in the society are promoted. Trauma is an inevitable part of human life, which is also the 5th leading cause of death and disability worldwide and accounts for approximately five million deaths annually. It can be caused by natural disasters or by human-made accidents. Victims of trauma suffer injuries ranging from small lacerations to permanent disfigurement or even loss of life. Maxillofacial trauma causes injuries to skeleton components, dentitions as well as soft tissues of the face and frequent cause of presentations in an emergency department. Varying from simple, common nasal fractures to gross commination of the face, management of such injuries can be extremely challenging. Injuries of this highly vascular zone are complicated by the presence of upper airway and proximity with the cranial and cervical structures that may be concomitantly involved. The incidence and pattern of maxillofacial fractures vary from country to country depending on prevailing geographical, social, cultural, and environmental factors. In developed countries increased the incidence of trauma were reported due to road traffic accidents (RTAs), however in developing countries and western world interpersonal violence is the most causative factor. Chennai is one of the metro cities in India and urbanization has induced multiple contributing factors for the high incidence of maxillofacial traumas. North Chennai is an important urban area and Government Stanley Medical College; Maxillofacial Trauma block is a major hospital in that region. The best source of information for the determinants and also specific factors contributing to maxillofacial trauma is medical case records. Analysis of these records will help to find out the prevalence and associated determinants related to maxillofacial trauma cases. The type and nature of maxillofacial injuries suffered by the people and to identify the common etiological factors, and also to analyze the influence of alcohol as a contributory factor in maxillofacial trauma is very important to assess the vulnerability of the society to certain trigger factors and to develop measures of primary prevention and care. Hence, the present study was conducted to find the prevalence and pattern of maxillofacial trauma in the Department of Dental Surgery, Government Stanley Medical College, Chennai from June 2013, to March 2014. A retrospective analysis was done on the medical case records of patients treated for Maxillofacial Trauma in the Department of Dental Surgery of Government Stanley Medical College, Chennai from June 2013, to March 2014. A total of 153 patients were treated for maxillofacial injuries, and their records of these patients were analyzed retrospectively. A structured proforma was used to collect the data regarding the age, gender, influence of alcohol, cause of trauma, and nature of the injury. The nature of the injury was recorded as injuries to teeth, injuries to the mandible, injuries to the maxilla, injuries to zygomaticomaxillary complex (ZMC), temporomandibular joint arthritis, and injuries to soft tissues. The data collected by the trained personnel's and privacy of the patient's data were maintained by the investigators by use of ultra-coding. Data were collected and spread on excel sheet. Statistical analysis was performed using the Statistical Package of Social Science (SPSS Version 20; Chicago Inc., IL, USA). Chi-square test along with Pearson correlation were used for analysis. Value of P < 0.05 considered as statistically significant. Among 153 patient's data, the most common age group suffered from such trauma was of 20–30 years where the children (3%) are found to be in the least vulnerable age group. About 86% were male. 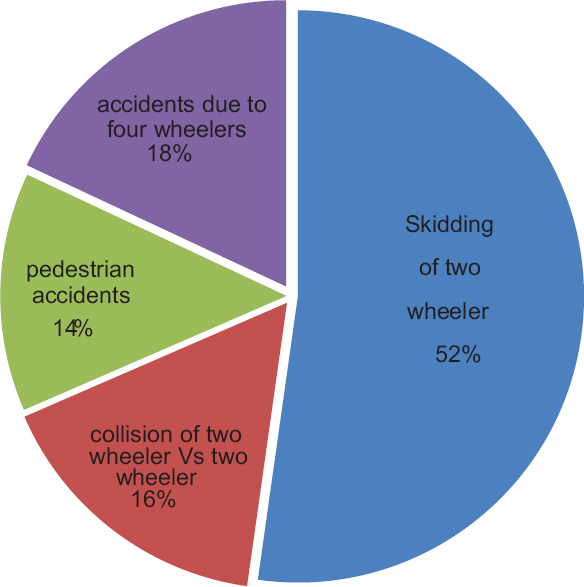 Regarding causes of maxillofacial trauma, 74% of the maxillofacial trauma was due to the road traffic accident [Table 1], and skidding of the two-wheelers was found to be the most common one (52%) [Figure 1]. Alcohol consumption (67%) was found to be an influencing factor in the majority of the cases. Most of these trauma cases were severe, and they were classified as grievous (85%). Dentoalveolar and zygomatic complex fractures were most (60%) and least (3%) common fracture respectively [Table 2]. 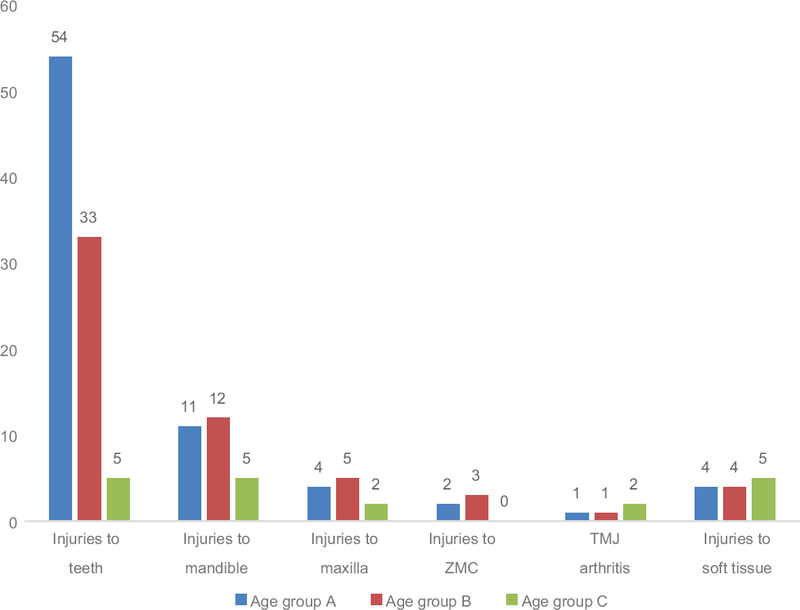 Age group wise distribution of the maxillofacial injuries shows that injuries to teeth are more common in younger age or Group A (11–30 years); injuries to mandible, maxilla, and ZMC are more common in Group B (11–30 years); injuries to soft tissue was found more common in Group C (51–80 years) [Figure 2]. This is a retrospective study done in the Department of Dental Surgery, Government Stanley Medical College, Chennai, to analyze the pattern, prevalence, etiologic factors, and management of maxillofacial trauma in and around North Chennai, which has got its own culture, habits, and even its own slang of language when compared to other parts of Chennai. Our study revealed that Road Traffic Accidents were the main causative factor of maxillofacial injuries and this is consistent with many other studies which have claimed Road Traffic Accidents to be the leading cause of maxillofacial fractures in developing countries., Males are at greater risk because of their involvement in high-risk activities which increases their exposure to risk factors such as driving vehicles, sports that involve physical contact, an active social life which involves usage of alcohol and drugs. However, increasing the prevalence of trauma among the females is also to be considered. This might be probably due to the changes in the women's social behavior, their involvement in nondomestic work, a greater active social life, a steady increase in the number of working women with more recorded participation in vehicular traffic. It should be understood that alcohol causes behavioral changes as a result of its psychopharmacological effects, which reduce the ability to make rational decisions. However there were also a few cases where, although the driver had not consumed alcohol, accidents were still caused because of an unexpected disturbance to traffic caused by pedestrians under the influence of alcohol. This quiet commonly occurs when the driver suddenly attempts to stop a speeding vehicle in an attempt to save an intoxicated pedestrian who might have crossed the road. The contribution of alcohol influence in causing maxillofacial trauma, along with the percentage of alcohol users involved, reflects the deep interrelation of these factors with the lifestyle and the poor socioeconomic status of the people of North Chennai. At this point, it becomes necessary to explore and understand how the socioeconomic status influences the habits and the day-to-day activities of the people. Socioeconomic status is measured as a combination of education, income, and occupation of an individual or a society. It is a key factor in determining the quality of life of an individual with resulting effects on his family and hence the society. Problems such as bigger families, uniparental families, lack of proper schooling, low per capita income, and increased number of school dropouts, unemployed youth, force the people to take up jobs with the poor working environment, long working hours, and less pay. They become victims of easy humiliation and exploitation. Hence, they often resort to habits like alcohol or drug abuse as a temporary relief from stress. In such a lifestyle people do not give preference to any of the safety measures, thus exposing themselves to traumatic accidents. Many similar studies, earlier have also proved this relation between the etiologic factors, the pattern of maxillofacial injuries and the socioeconomic status of the people. It was also observed that most victims were in the age group of 20–30 years. This age group can be classified as a phase of life with great personal independence, social excitement, intense mobility, with careless driving on the roads. The influence of alcohol on these youngsters adds to these effects and thus reflects the vulnerability of the society to ill-effects of alcohol. We also found that two-third of the patients had injuries to teeth such as avulsion of teeth, fracture, subluxation, and intrusion of teeth into the soft tissues. As already documented dentoalveolar fractures commonly occur in bike accidents especially when the security mechanisms are neglected. Damage to teeth in any form badly affects the aesthetics of the person and can even cause long-term psychological impact on the person. Mandible was most commonly involved in fractures of facial bones followed by fractures of the maxilla and the zygomatic complex. Fracture of the mandible occurs in accidents involving skidding of two-wheelers, when the person either falls down from the vehicle or hits against the vehicle itself, when he suddenly applies the brake, thereby transmitting a direct blow to the mandible. Fracture of the maxilla and other bones of the face occur in accidents involving the collision of vehicles, where the force and momentum are directly transmitted to the entire face. Both these types of potentially dangerous injuries can be prevented by wearing a fully covered helmet. It was found that cases of open reduction and fixation had reported with infection due to poor oral hygiene and repeated alcohol consumption. So conservative management was preferred unless the clinical condition warranted a surgical intervention. Maxillofacial trauma deserves special attention because of the direct injury created on the face, with possibilities of permanent damage to vision, hearing, mastication or aesthetics. The easy accessibility of the face to trauma can be attributed to the protective role played by the skeletons of the face which take up the impact and protect the cranial structures. It is very essential and mandatory for society and the government to consistently assess the trend of maxillofacial trauma and take all steps to reduce it because of the ease with which it can occur coupled with the severity of the damage it can inflict on the victim. More emphasis should be placed to understand the society as a whole and to strengthen the level of primary prevention of RTA, violence and other causes of trauma. Raising the socioeconomic status of the people removes their insecurities and in turn improves the quality of life and reduces their vulnerability to alcohol, drugs and other factors. This helps in bringing about a much needed behavioral change, where the people become sensitive to the various preventive measures such as the use of seat belts, wearing of helmets, adoption of defensive riding skills, strict adherence to the traffic rules and develop a personal commitment to ride safely always. 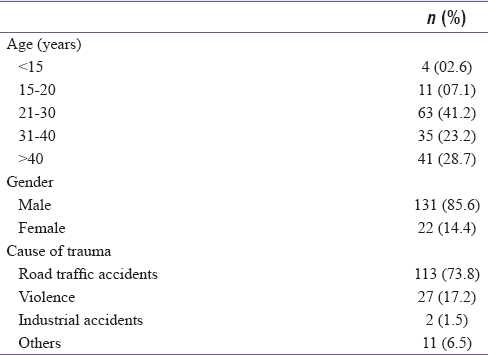 The study concludes that road traffic accidents are the major cause of maxillofacial trauma. Influence of alcohol is an important etiologic factor. Younger persons are more prone to experience such injuries. The findings of this study indicate the need to develop measures to strengthen the values of the society, to develop effective educational and communicational strategies, and to encourage the implementation of policies aimed at reducing maxillofacial injuries. The old saying “Prevention is better than cure” holds good. Jose A, Nagori SA, Agarwal B, Bhutia O, Roychoudhury A. Management of maxillofacial trauma in emergency: An update of challenges and controversies. J Emerg Trauma Shock 2016;9:73-80. Israr N, Shah AA. Retrospective study of zygomatic complex fractures in Sheffield, England. Pak Oral Dent J 2001;21:50-9. Oikarinen VJ, Lindqvist C. The frequency of facial bone fracture in patients with multiple injuries sustained in traffic accidents. Proc Finn Dent Soc 1975;71:53-6. Mason PN. Facial injuries. In: McCarthy JG, editor. Plastic Surgery. Philadelphia: Saunders; 1990. p. 868-72. Agnihotri A, Galfat D, Agnihotri D. Incidence and pattern of maxillofacial trauma due to road traffic accidents: A prospective study. J Maxillofac Oral Surg 2014;13:184-8. Umar KB, Shuja RA, Ahmad K, Mohammad TK, Abdus S. Occurrence and characteristics of maxillofacial injuries – A study. Pak Oral Dent J 2010;30:57-61. Al Ahmed HE, Jaber MA, Abu Fana SH, Karas M. The pattern of maxillofacial injuries in Sharjah. Oral Surg Oral Med Oral Pathol Oral Radiol Endod 2004;98:166-70. Telfer MR, Jones GM, Shepherd JP. Trends in the aetiology of maxillofacial fractures in the United Kingdom (1977-1987). Br J Oral Maxillofac Surg 1991;29:250-5. Hutchison IL, Magennis P, Shepherd JP, Brown AE. The BAOMS United Kingdom survey of facial injuries part 1: Aetiology and the association with alcohol consumption. British association of oral and maxillofacial surgeons. Br J Oral Maxillofac Surg 1998;36:3-13. Buchman J, Colquhoun A, Friedlander L. Maxillofacial injuries at Waikato Hospital, New Zealand; 1089 to 2000. N Z Med J 2005;118:12-7. Shah A, Shah AA, Salam A. Maxillofacial fractures-analysis of demographic distribution in Ugandan tertiary hospital; a six month prospective study. Clinics 2009;64:843-8. Chandra Shekar BR, Reddy C. A five-year retrospective statistical analysis of maxillofacial injuries in patients admitted and treated at two hospitals of Mysore city. Indian J Dent Res 2008;19:304-8. Eggensperger N, Smolka K, Scheidegger B, Zimmermann H, Iizuka T. A 3-year survey of assault-related maxillofacial fractures in central Switzerland. J Craniomaxillofac Surg 2007;35:161-7. Erol B, Tanrikulu R, Görgün B. Maxillofacial fractures. Analysis of demographic distribution and treatment in 2901 patients (25-year experience). J Craniomaxillofac Surg 2004;32:308-13. Hussaini HM, Rahman NA, Rahman RA, Nor GM, Ai Idrus SM, Ramli R, et al. Maxillofacial trauma with emphasis on soft-tissue injuries in Malaysia. Int J Oral Maxillofac Surg 2007;36:797-801.